Ever since I received a meat grinder attachment for my Kitchen Aid last Christmas, I have been itching to make some ground turkey. We had a few biggin's leftover from the holidays. After thawing out the bird, I went to work breaking it down. For the most part it was just like parting out a chicken, only much larger. To be honest, this was the most difficult part and admittedly would've been easier if I had sharpened my knives beforehand. I parted out into wings, drumsticks, boneless thighs and boneless breasts. I wrapped up the drumsticks in aluminum foil and placed back in the freezer to be smoked another day. The wings and rest of the carcass were thrown into a big stock pot with carrots, celery, onions and seasonings to simmer away into stock. I think I ended up with about 7 quarts of stock! Next I went to work on the ground. It was surprisingly easy to slice the boneless breast and thigh meat into chunks and run it through the grinder. After it was all said and done we got about 10 lbs of ground meat from our 24 lb bird, a ratio that I was pretty pleased about. We packaged into 1 lb portions in Ziploc bags and stored it back into the freezer. Ideally we would have done all this with a fresh bird, but we haven't noticed any quality loss from the thaw and refreeze. We've been enjoying our ground turkey in burgers, spaghetti and meatballs, enchiladas - any place really where we'd normally use ground beef or pork. It's quite lean even with the thigh meat mixed in - which is desired by some, but if you're looking for a higher fat content, you could simply mix in pork fat during the grind. If you would like to join me on this crusade, we do have a few extra holiday birds that we are eager to clear out of the freezer. 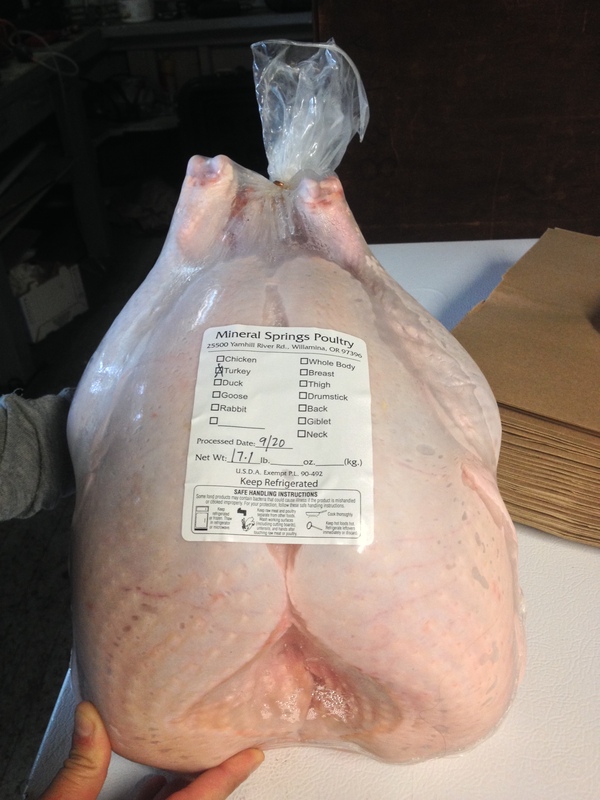 We are offering a huge special on our frozen turkeys - $60/bird. These are big guys (20 lb+) so you cannot beat this price per pound! Smoke one whole for the 4th of July, save for a future family gathering or part it out and enjoy a little at a time. We only have a couple available so first come, first served. Email us at mail@fairvalleyfarm.com to order yours today. Don't forget - CSA members receive 10% off. What kitchen projects have you been working on lately? I'm starting to look forward to canning season - just around the corner!